When I was in college, my grandma once called to tell me that I needed to watch my cup at parties because there are “roofies.” Obliviously she was watching Primetime or 60 Minutes. In all honesty, I am a little disgusted looking back at how many germs I probably contracted from college parties. From beer pong balls that fell on the ground, to uncleaned beer taps, it’s no wonder I got sick all the time. Now that I am a more mature adult, I know there are ways out there to mark your drink at a party. Let’s face it, while I have grown up, I still love a good game of beer pong. Write it Out. Crayola makes these clever window markers. Kids can doodle on windows and it wipes away with some soap and water. WELL, adults can use these to doodle on wine glasses. You can write your name on the glass (or my friends would probably write something obscene. Etch-a-Sketch. Plum Party sells the red glasses above in which you etch your name into the cup. For those of you who don’t want to get too crafty, this is probably the best option for you. How Charming. I don’t know about you, but I think the wine charm fad is dumb. You can totally make this buy buying the wire circles and then adding some beads. The Bead Mine in the South Side of Pittsburgh is great for beads (duh) and charms! Brass Monkey, That Funky Monkey. 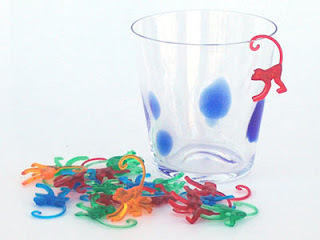 Perpetual Kid sells colorful monkeys that rest on the rim of the glass. They also make a Pink Elephant version that would be great for a post-holiday gift exchange. DIY. Michael’s and JoAnn Fabrics sell plain circles that you can craft up to match the theme of your party. 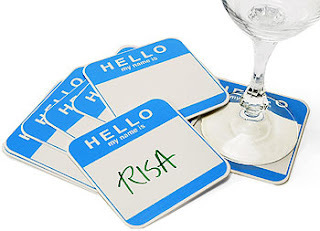 Hello My Name is… Plum Party makes cute these cute coasters to the left that guests can write their name on. I like this idea because it promotes using a coaster and marking your drink. 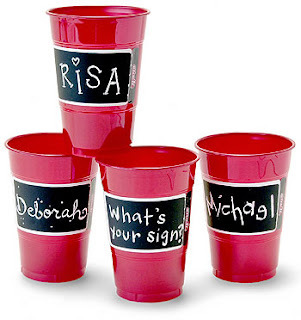 Regardless of what option you select, if you have plastic cups at your party, it’s always nice to keep out a Sharpie so that guests can mark their cup if they are a germ-a-phobe. When your name is on the cup, you are also more reluctant to throw the glass away at the end of the night.